City of Copenhagen reports that 7944 potholes/issues have been reported by the citizens. The City has repaired 6396 of them. 911 of the shouts were rejected. The City of Copenhagen's Technical & Environmental Administration (what other people refer to as Dept. of Transport) has launched a new website called 'Giv et praj', or 'Give Us a Shout' in English, wherein citizens can make the city aware of various issues on the urban landscape. The City will then endevour to fix the problem and you can also track the progress on the website. How cool is THAT?! - Cycling shortcuts that can be improved with a bit of asphalt. - Missing bicycle symbols on the asphalt. - Places that could use bicycle-friendly signage. On the website you can enter the address or place it on an interactive map, as well as upload a photo of your shout out if you have one. You can also see all the other shout outs from your fellow citizens on the map. The website is for everyone, not just those of us who cycle. There are also categories like garbage issues, animals (dead animals and rats), grafitti, lighting, parking, signage, trees and bushes and roads. 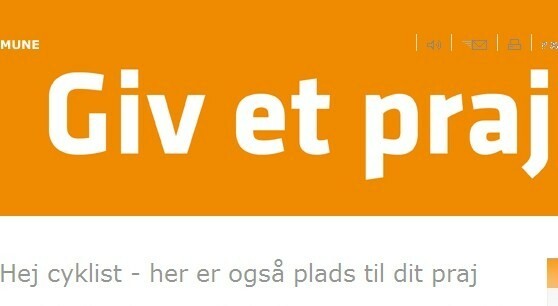 The Giv et praj website is in Danish, but it's still lovely. Isn't this how living in cities should be? Citizens interacting with the administration and having a concrete and positive effect on the daily life of the metropolis.